The single-chambered Bat Bungalow is designed for small groups of males who prefer their own 'bat'chelor pad! Handcrafted from recycled redwood. 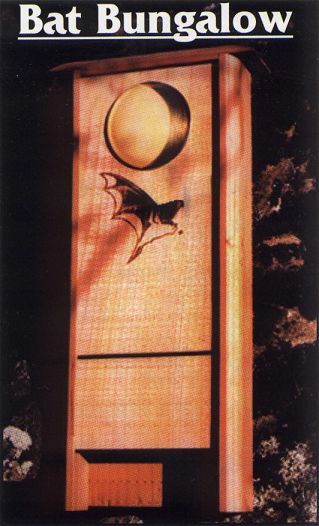 The moon of this bat box is etched in brass. Features: Houses up to 20 bats A natural bug zapper! Terrific conversation piece and exterior house accent Encourages bats to be nearby, but not in the eaves of the family home. About Bats A single brown bat can consume up to a thousand mosquitoes per hour! More and more people are discovering the advantages of providing housing for bats. Our bat houses combine artistry and science, providing a safe haven for bats in a handsomely crafted garden accent.